We could not speak more highly of John from Blooming Landscapes. He did a fantastic job for us, when we re-landscaped our entire back garden. John had been recommended to us by friends who had used him previously. We approached Blooming Landscapes and a couple of other companies. We were impressed from the outset when he took our initial thoughts and converted them into a visual design. It was clear that he had listened to everything we wanted and could see our vision. He made good suggestions and was willing to work within our budget to help us get everything we wanted. The work involved an extensive patio area (including complete removal of the existing patio), decorative brick wall border, large patio/seating area, an area for a water feature and planting a number of trees. We couldn't have asked for a better partner in this project and can't recommend him highly enough. We have subsequently recommended John to others who have been equally as pleased as we are. I am writing to say how delighted we both are for the wonderful transformation which you have brought about in our garden. The completed project fully reflects all of our desires, incorporating both the constructional features specified and the selection and siting of our preferred plants, resulting in a co-ordinated landscape with great longer term appeal. We have been very impressed with your professionalism and by the clean and methodical way in which you have undertaken the work with minimal inconvenience to ourselves. You deserve to succeed in your chosen career and we wish you every success in the future. I wanted to let you know how pleased I am with my new landscaped garden and to thank you for all your hard work. You created a garden that makes the most of the available space and light, meets all our requirements and is delivered to a high standard. I can't wait for you to complete the planting and some good weather to really appreciate the transformation. Over Christmas a number of our neighbours enquired about our garden as they were contemplating having similar work. I was pleased to recommend you to them as you have very good ideas, are reliable and very professional. We would like to say thank you very much for all your hard work. We are absolutely delighted with the work you have done and look forward to spending many happy hours in the garden. I am really thrilled with the results of your hard work on the front garden. The finished article looked great when I got home this evening and really improves the appearance of the house. I couldn't have hoped for it to turn out any better. The planting plan is just fine. I'm looking forward to the horticultural bit now that you've done all the hard slog on the landscaping! My cheque is enclosed in payment of the invoice - and worth every penny. Thanks again for my improved front and for looking after the house (and the dog!) whilst I was at work. Just a short note of thanks for the work you have done. We are both extremely pleased with the garden, and the way you carried out the job from start to finish - it is exactly how you said it would be! The garden is the talk of the neighbourhood! We would be more than happy to recommend yourself should anyone enquire about the garden. Once again thanks and regards. I would also like to take this opportunity to thank you for all your hard work in my garden. I am really delighted with the result and looking forward to getting going on choosing plants to finish it off. I will no doubt be in touch in the future when I’ve had some thoughts about what I would like to have at the front of the house. Just a quick note to say a huge “Thank you” for transforming our garden. You were very professional and a pleasure to have around. The boys will miss watching you every day. We will of course recommend you to everybody we know or meet. We have already sat on the patio admiring our garden this evening - it’s really great. Many thanks once again for the work you did on our front garden. It has already raised many comments and I am sure once we have got it planted it will give cause to many more. This along with the excellent work you did for us on the rear garden has helped to make us really happy with the appearance of the house. Also as far as the rear garden is concerned will shall enjoy many years of pleasure in planting and just sitting and enjoying it. Thank you once again. Thank you for such an excellent job on the garden - again! I'm really thrilled with the results. You have delivered everything I wanted with the unexpected bonus that the garden looks quite a bit bigger with more structure - I'm sure it will show the plants off really well and they will benefit enormously from the improvements you have made to the soil. I must also congratulate you on finishing exactly on schedule and leaving everything so clean and tidy despite the weather being really awful for most of the time. 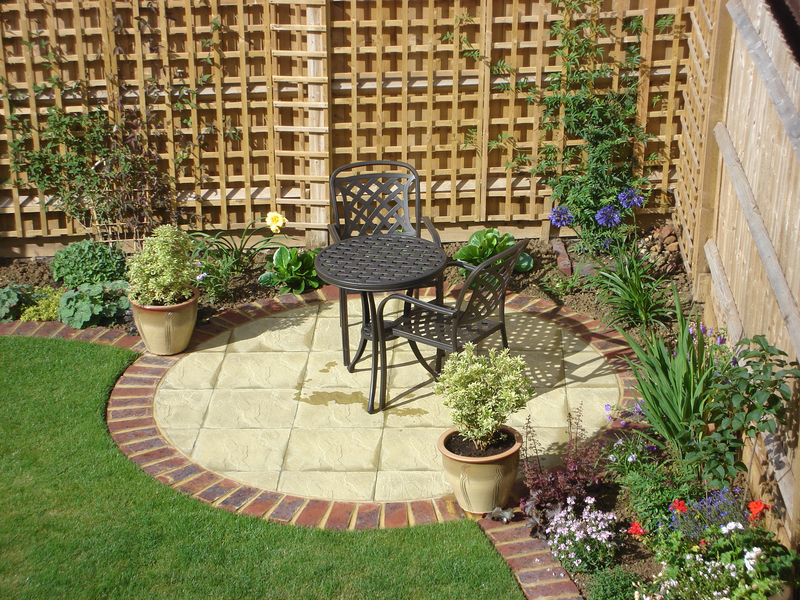 I would recommend you without hesitation to anyone wanting a professional makeover on their garden. Thanks so much for all the hard work you put into our garden. It really is looking fantastic and its great to have space to play. We know it wasn’t an easy one, but we really do appreciate it. I would like to take this opportunity to thank you for the works you have carried out on our home. In today's market, when choosing a Company it sometimes is a lottery, in your case it has been a pleasure from start to finish. Your service and professionalism at all times has been perfect, in fact the whole contract has exceeded our expectations. You have kept the site very tidy at all times even in inclement weather, completed the works exactly as we had discussed, advising and suggesting changes which have enhanced the project. We would have no hesitation in the future of securing your services for any further works, or of recommending your Company to any interested parties. Mandy and I are delighted with our new drive and rockery which has been constructed to the same high standard as the rear garden that you did for us last year. We have yet again been so impressed with your professionalism and attention to detail and we will continue to recommend you at every opportunity. We both wish you every success for the future and feel privileged to have "found" Blooming Landscapes. Thank you for transforming our patio into a fantastic new area for plants and relaxing in. I am looking forward to making use of the new raised beds which will be so convenient for growing herbs and salad leaves for the kitchen. The subtle colours in the slabs are lovely, and they are non-slip when walking out in the rain. Your workmanship was meticulous and you were reliable and trustworthy - I was able to go out and not worry abour leaving the house. Also thank you for clearing up so thoroughly, everything was spotless, pity it won’t stay like that! Hopefully we’ll contact you in the future to pave the path to match. We just want to let you know how pleased we are with the end result of the works. We were impressed with the professional and realistic approach you had when the proposal and scope of works. were discussed. The same applies to your professional attitude and by the way you work as a team in an orderly. and efficient manner, and at all times cleaning up the areas during the works and at the end of each working day. Your communication with your client was absolutely perfect and we have no hesitation in recommending Blooming Landscaping services to anyone in the future. On a separate note we received your proposal and estimate for the works we intent to have done in the rear garden and terraced areas of the house. We are thinking of those works carried out early next year and I will be writing reply to the proposal by separate letter. Our initial opinion of the work you carried out was that it was a good job completed very professionally in what started out as not the best of weather conditions. The following weekend when we actually got a chance to have a closer look at the garden only served to confirm this. All those who have seen the garden are very impressed and have commented very favourably on the design, materials and standard of workmanship involved. We only wish that we had made the decision to get the side section of the garden done at the same time! Again, many thanks for providing us with a greatly improved garden and we look forward to hopefully employing your services in the future. I must say it is a pleasure to open the blinds in the morning and admire my beautiful garden. Thanks for he shrub/plant suggestions, it has been a pleasure having you here & I will definitely recommend your services. We are very pleased with everything you have done and look forward to enjoying our ‘new’ garden! You worked extremely hard despite the very high temperature at times. All the work has been completed to a very high standard with plenty of attention to detail. Thanks for your hard work on my garden - I’m really please with the result and I imagine I’ll it even more when the plants go in. I’ll email some pics in due course! Just been looking at the garden created by you two again and we have to say that the total experience has been a great pleasure. Your ideas were sound, your workmanship excellent. Thank you so very much for all your hard work in producing a wonderful landscaped garden for us to enjoy. You have restored our faith after a dreadful experience with previous “landscapers”. I am sorry I did not see you to thank you personally but as so many of our neighbours have commented on the quality of your work, I anticipate that I will see you on the estate next year! Renewed thanks and wishing you every professional success in the future. I would like to take this opportunity of thanking you very much for the outstanding work you have completed at our home. We were both very impressed by your attention to detail, your work ethic and your professionalism. Not to mention your stamina!! I know Steve will miss his "site meetings" where he had the opportunity to go through with you stage by stage. Our pation and decking look fantastic and we are very excited at the prospect of developing it further with planting etc. With all best wishes for your future.